Welcome to the Tarakanita School of Communication and Secretarial Studies! 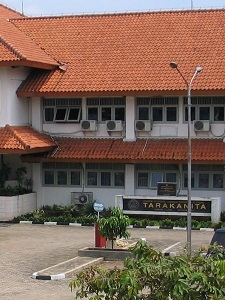 Tarakanita School of Communication and Secretarial Studies is a Catholic Educational Institute. Its consistent commitment is to empower young Indonesian women through quality professional and academic training and development. The goal is to create administrative and communicative professionals embracing both spiritual and human values. In line with the competitive work-place pressures in a continuously growing industry, the institute endeavors to equip the young women with new methods of fast learning to acquire the skills, knowledge, attributes, and human values in order to meet local and global work-place challenges. Through intra and extra-curricular activities and internship programs, students are well-exposed to real work-place requirements and challenges. We welcome everyone to be part of the Tarakanita Community. Sr. Fransisca Dwina Arintowati CB, S.Psi., M.A.Ed.